You have a five-minute window to get a freebie from Nothing Bundt Cakes Tuesday only! Get the freebies on Tuesday only! Nothing Bundt Cakes is opening its 300th bakery Tuesday, and they want to celebrate with you! 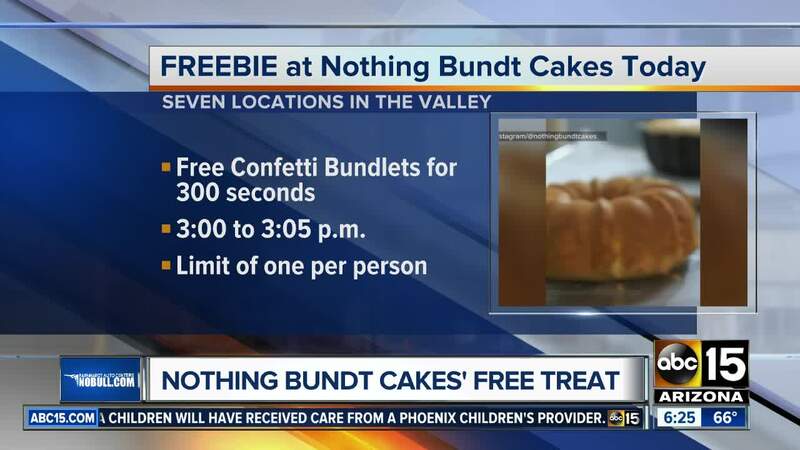 On April 9, all locations across the United States, including seven right here in the Valley, will give away confetti bundtlets for 300 seconds today. That means, starting at 3 p.m. to 3:05 p.m., you have a chance to score a freebie! It's a limit of one per person, and no coupon is required. Just be part of the 300 in the bakery to get the free sweet treat!